From ANNIE to PHANTOM to WICKED, this fall-down funny, satirical roast of over30 Broadway hits features outrageous costumes, silly spoofs of the songs you know by heart and madcap impressions by a stellar cast! Newer spoofs include HAMILTON, THE BOOK OF MORMON and ONCE. It’s never been more fun poking fun at your favorite musicals and stars! A New York sensation for 35 years, a talented quartet of comic chameleons throw out pointed parodies at a dizzying pace. Whether you are a seasoned theatre-goer or new to it all, the Tony Award® winning Forbidden Broadway is your one-stop ticket to non-stop laughs: a hip and fresh view of theatre’s tried and true that will leave you begging for more! 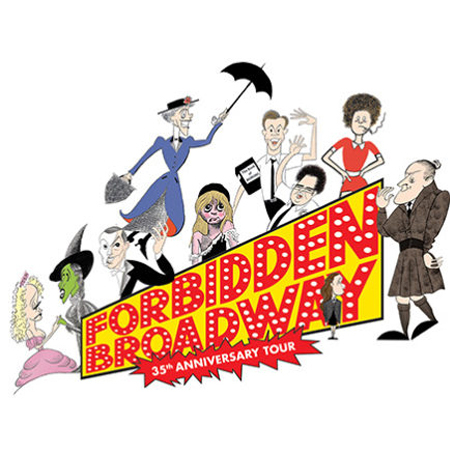 Forbidden Broadway is the recipient of a Special Tony Award®, an Obie Award, the Outer Critics Circle Award and the Drama Desk Award for Best Off Broadway Musical, and a for 2013 Drama Desk Award nomination for its most recent edition, Forbidden Broadway: Alive and Kicking!